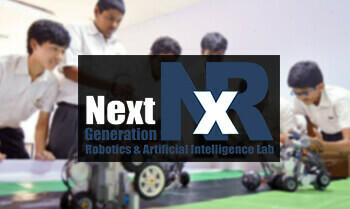 Aicra launched back in days, "NxR Generation Robotics Lab (NxR)" otherwise known as AICRA Certified Robotics Lab Center. The concept established with the motto of "Creating an eco-system where learners become inspired by robotics & automation technology, imbibe technology and get exposure to international competitions. We have conquered short term instructional courses, and now we are ready to look beyond it, which is in itself is a big accomplishment. Robo Labs helps in mixing the creativity and curiosity of young students with the hands-on education aspects on Science & Technology. With focus on Robot building and Science based activities, our learning methodology takes up innovative and challenging ideas and converts them into radical in nature solutions in the form of workable robots or engaging science experiments, which ever you may prefer. For instance institutes can add-on Robotics as subject for its entire student' studying Science, Technology, Engineering and Mathematics ISTEM, and which is very reasonable thing to do in this ever changing world.